To assist districts and schools in determining oral proficiency equivalent to AP and IB scores designated in the criteria, we recommend, although a local decision, the adoption of the Intermediate Mid-level guidelines established by American Council on the Teaching of Foreign Languages (ACTFL). This is the level equivalent to a “3” on most AP language exams and is the recommendation from four national organizations in the Seal of Biliteracy Guidelines. ACTFL has many resources such as their oral proficiency assessments to assist with this determination. Included on the website are Proficiency Guidelines that will describe what is expected at intermediate mid-level. In the guidelines, there is a descriptor for each of the languages in the areas of oral, written, reading and listening language with some recorded language samples. We recommend the use of the ACTFL rubrics by world language teachers to assess classroom activities such as one-on-one interviews, oral presentations, collaborative conversations, and observation of classroom participation to determine oral proficiency of their students. Resources also include the “Can Do Statements” which can also be used to design lessons, in-class assessments and rubrics. Also, districts may choose to use the official ACTFL Oral Proficiency Interviews (OPIs) that are currently available in the following languages (but are subject to change): Afrikaans, Akan-Twi, Albanian, Amharic, Arabic, Armenian, Azerbaijani, Baluchi, Bengali, Bosnian, Bulgarian, Burmese, Cambodian, Cantonese, Cebuano, Chavacano, Czech, Dari, Dutch, Egyptian, English, French, Georgian, German, Greek (Modern), Gujarati, Haitian Creole, Hausa, Hebrew, Hindi, Hmong/Mong, Hungarian, Igbo, Ilocano, Indonesian, Iraqi, Italian, Japanese, Javanese, Kazakh, Kashmiri, Korean, Kurdish, Lao, Levantine, Malay, Malayalam, Mandarin, Marshallese, Nepali, Norwegian, Pashto, Persian Farsi, Polish, Portuguese Punjabi, Romanian, Russian, Serbian Croatian, Sindhi, Sinhalese, Slovak, Somali, Spanish, Swahili, Swedish, Tagalog, Tajik, Tamil, Tausug, Telugu, Thai, Tigrinya, Turkish, Turkmen, Uighur, Urdu, Uzbek, Vietnamese, Wolof, Wu and Yoruba. The College Board World Languages Framework and the AP Language and Culture 2017 Scoring Guidelines for Interpersonal Speaking: Conversation and Presentational Speaking: Cultural Comparison also provide guidance to world language teachers to assess the level of oral proficiency in Spanish, Italian, German and French. The California Department of Education Seal of Biliteracy website is another great resource. Included on the website are written communications, a requirements checklist, instructions on how to request Seals for your students and a listing of all school districts participating in the program in 2016-17 with the languages for which the students were recognized. If you are looking for resources for a particular language, refer to this list and then contact the district for the procedures and tools they use for that particular language. With the passage of the English Learner Roadmap setting high standards for English Learner biliteracy programs and the passage of Proposition 58, the EdGE Initiative, with 73.5 percent of the electorate voting to support multilingual programs, all school districts should consider establishing a Seal of Biliteracy Program. For support in beginning a district program, please go the Seal of Biliteracy website for ideas about initiating and implementing a program in your district. All students should have the opportunity to graduate with a Seal of Biliteracy on their diploma. California became the first state in the nation to adopt a State Seal of Biliteracy, igniting a national movement, California voters overwhelmingly (73.5%) supported the passage of Proposition 58 the LEARN Initiative to promote and encourage multilingual programs for all students. Parents and educators are now encouraged and empowered to implement multilingual programs, preschool through 12th grade, for all students. 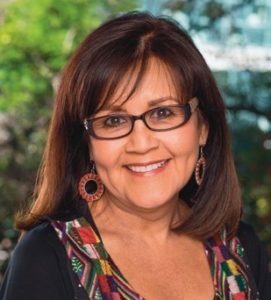 Building pathways to biliteracy requires communities and school leaders to become familiar with the variety of language program options, the research behind them, and the conditions that support effective implementation. AB 815 (Brownley) established the state Seal of Biliteracy Program to recognize high school graduates who have attained a high level of proficiency in speaking, reading and writing in one or more languages in addition to English. The State Seal of Biliteracy shall be awarded by the State Superintendent of Instruction when students meet the criteria contained in the legislation. 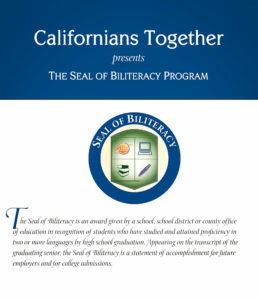 There are 9 states including California with a formal State Seal of Biliteracy Program. Ten other states and the District of Columbia Public Schools are in the process of developing their program. Click to download the legislation.